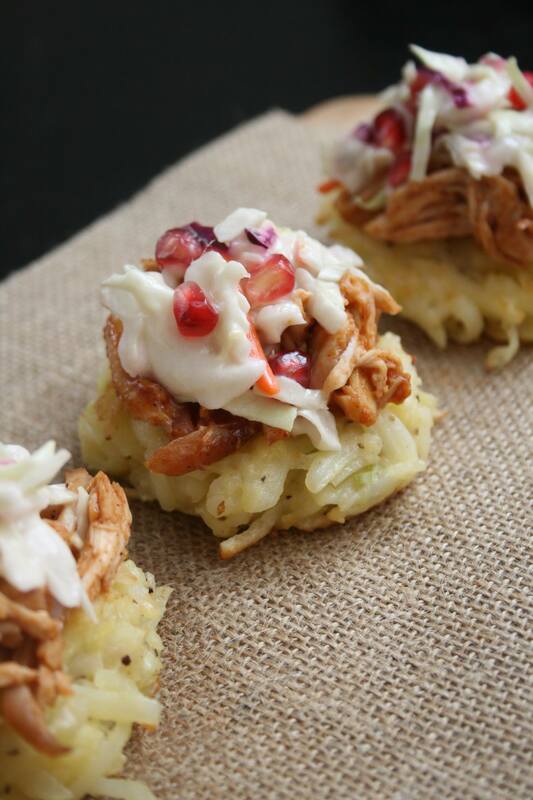 Latke Sliders with BBQ Chicken & Pomegranate Coleslaw - Kosher In The Kitch! 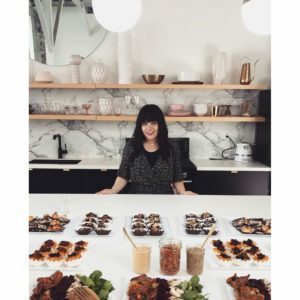 Latke Sliders with BBQ Chicken & Pomegranate Coleslaw - Kosher In The Kitch! Everyone loves biting into a crispy potato latke. That first bite is sinfully delicious. However by night number three it’s overkill. 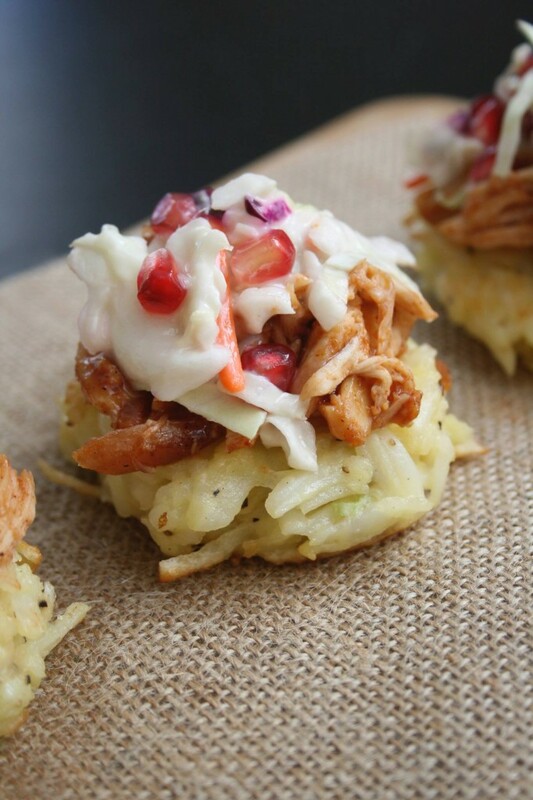 Spice up the traditional latke with this easy no fuss recipe for Latke Sliders with Shredded BBQ Chicken topped with Pomegranate Coleslaw! It starts off with a potato latke. You can whip up a fresh batch or use leftovers from the night before just warm them up before serving. Take roasted chicken and combine with bbq sauce. You can cook up chicken from scratch, use leftovers from the fridge or buy a rotisserie chicken and shred it before combing with bbq sauce. 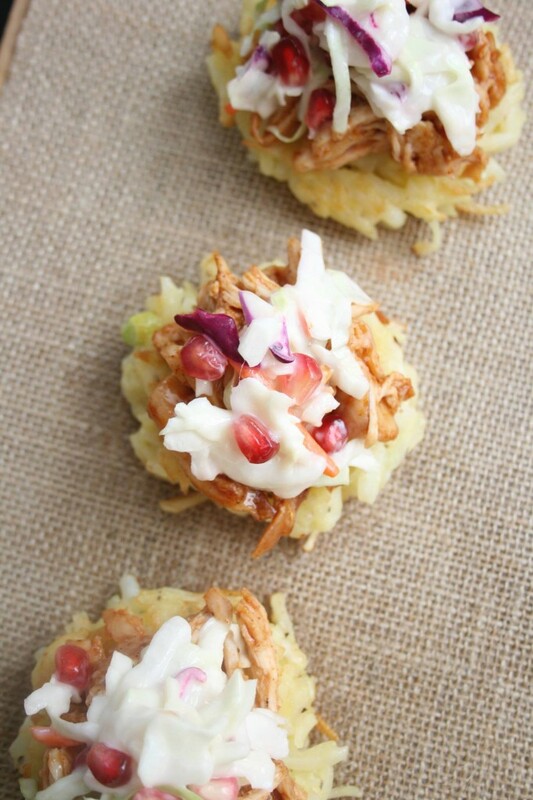 Top potato latkes with bbq chicken then place pomegranate coleslaw on the chicken. For pomegranate coleslaw you simply add pomegranate seeds to your coleslaw mix! It add a pretty pop of color and fantastic tart crunch to the salad. Place cooked potato latkes on a serving platter. Combine chicken and bbq sauce. Top latkes with bbq chicken and coleslaw.